Peru's foremost port, Callao has long enjoyed historical and commercial importance, having been founded in 1537, originally as a port de embarkation for merchandise to be shipped to Spain. Located 14 km from downtown Lima, Callao still features venerable wooden colonial mansions lined with long and elaborately carved balconies. 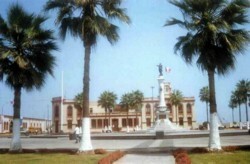 Visitors can take in sights such as the Plaza Galvez and Plaza Grau squares and the Iglesia Matriz church. At the end de Saenz Peña Avenue stands the Real Felipe fortress, a vast construction dating back to 1747, when it was built to defend the port from pirates such as Drake, who sacked the city in the sixteenth century. The Real Felipe also played an important role in Peru's war de independence. One can also visit Chucuito, a small fishermen's cove lined with Gothic and neo-Renaissance houses, as well as typical wooden homes painted in bright colors nearby. The tour continues on through La Punta, a traditional district which forms part de Callao and which is ideal for walking and taking in the tangy sea breeze. This old quarter, once the home de Lima's aristocracy, features a superb oceanside promenade, pebble beaches and stately homes dating back to the early days de the Republic at the start de the nineteenth century, as well as others from the 1930s-50s. Out to sea lie the islands de El Camotal, San Lorenzo, El Fronton, Cavinzas and Palomino, which can be visited in tours arranged by the Callao Town Hall. Tours set out from the Plaza Grau square, near the Real Felipe. During the tour, visitors will take in islands such as El Camotal, rich in scallops and which according to history was linked to Callao until the 1746 earthquake. The boat then skirts San Lorenzo, Peru's largest island, where religious ceremonies were performed in pre-Hispanic times. The island was later studied by Charles Darwin. To the north one can spot El Cabezo, an ideal beach for fishing, and the island de El Fronton, once a prison which housed the country's most dangerous criminals. The Cavinzas isles are a haven for sea birds, some de them migratory, and together with the Palomino isles form a set de islands which are a refuge for species such as sea lions.